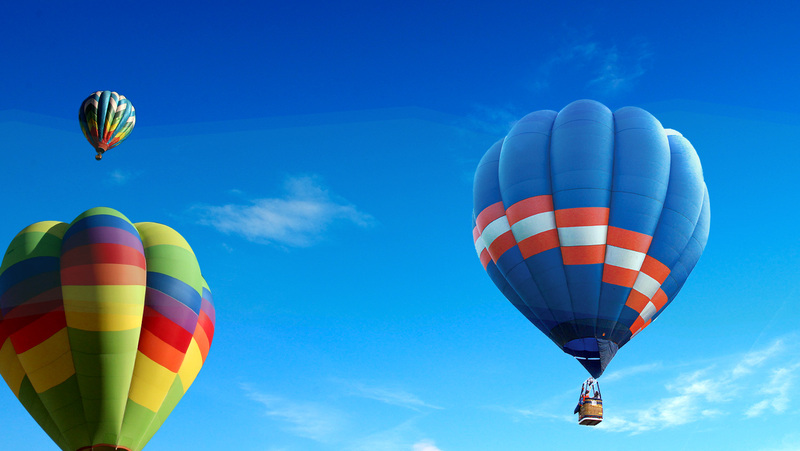 If you’re looking for things to do in Pahrump, let me direct you to two different organizations that provide the opportunity to explore, discover, preserve, and have fun while you’re at it. 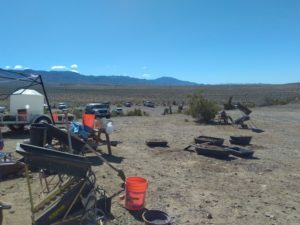 These two groups are the Nye Gold Seekers and the Nye County Rockhounds, sometimes referred to as the Pahrump Valley Rockhounds. They both meet regularly and have several outings each year. Both are membership organizations, but anyone is welcome to attend their meetings or go on their outings with them. Let’s take a look at each one individually. The Nye Gold Seekers or NGS for short, meet twice a month. On the second Saturday of the month, they host an outing to their 20-acre claim about 18 miles out of town. Here they dig for gold, have some lunch, and enjoy the comradery of like-minded people. They teach each other techniques and share knowledge and information about prospecting and preserving the environment. On the third Saturday of each month, they hold a business meeting at 2:00 pm at the Pahrump Valley Museum located at 401 E. Basin Rd. They work hand in hand with the museum and help them whenever they can. They donate time and items to them. At these meetings, they discuss their future plans for the group. They decide which town events they’ll participate in during the year such as The Chili Cookoff, Wild West Extravaganza, Fall Festival, the Gold Show in Las Vegas, and the like. They also hold classes on mining techniques and talk about their goals and objectives for the group. Due to the heat and the fact that many members travel during the summer, NGS doesn’t meet nor do they have outings in June, July, or August. One of the underlying purposes of the group is to reach out to the youth of today and teach them placid mining as well as the preservation of our surroundings. When the group goes on an outing, they leave nothing behind. If they dig, they fill up the hole. Whatever they take onto the claim with them, they bring back out when they leave. They bring their tools with them each time they visit the claim and take them away when they’re completed.No diggers are allowed…only handheld equipment is permitted. In addition to digging for gold, many people come with their metal detectors to look for other treasures. If members need equipment, the club will loan it to them for a two-week period. Anyone can go to the NGS claim, but only members are allowed to prospect. If you’re interested in establishing a claim yourself on BLM land, several websites explain the process and give you access to the appropriate forms. Although there are federal rules, each state has specific requirements as well. Members can make a claim within the NGS claim by putting a stake in the ground…literally. They may dig within one shovel handle of that stake. Twice a year, they have a bar-b-que and clean up at the claim. Members and other volunteers help pick up any debris or other unnatural items found on the land. There are some old mines on the claim, but they are cornered off and off limits to everyone. Unfortunately, many people don’t realize how fragile and dangerous these old mines can be and get themselves into trouble or hurt while trying to explore. Staying away from them is important. Bonnie Johnson, current President of the NGS, says she’s been doing this for about five years. She has never encountered a snake, scorpion, or spider and is happy about that. The only animals she’s come across are wild horses and burros. She relates that people find gold all the time on their claim. It’s usually found in the form of flour gold and flakes. Once, she discovered what they call a picker, which means you can pick it up with your fingers or tweezers, and it does not have to be sifted. Hers was a little smaller than a small pea. But she cherishes it. No one in the club sells their gold. They keep it for souvenirs of their adventures in prospecting. Bonnie says you’ll never get rich doing this. They are out there to have fun, learn, and enjoy what Mother Nature has provided. If you dig a hole, you must fill it in. When asked how deep you have to dig to find gold, Bonnie said it could be three inches or four feet. It could be at any depth, and there are no guarantees you’ll find any. To join the Nye Gold Seekers, it costs $36 a year with a one-time filing fee of $10 when you first sign up. If you’re interested in learning more about the organization, contact Bonnie Johnson at ngspresident50@gmail.com. 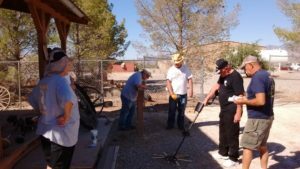 The other group of explorers is the Pahrump Valley Rockhounds who search for unusual rocks and gems on or in the ground. They too are in search of history, knowledge, and are also concerned about the preservation of the environment. Tom Edwards, President of the organization, says you can always tell Rockhounds. While everyone else is looking at the surrounding scenery, they are looking down at the ground. What are the Rockhounds All About? 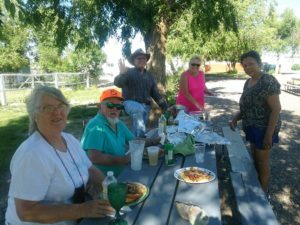 Their definition of their group is “we are a club of Rockhound enthusiasts who enjoy going out on field trips to collect rocks and gems.” They plan several trips each month. Sometimes for one day while others are for four or five. They camp out and enjoy sitting around the campfire at night telling rock stories or talking about other adventures. If you don’t have camping equipment or prefer a more comfortable bed, there are usually motels nearby their destinations. 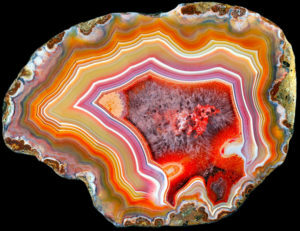 The basin area we live in is especially suitable for finding agates, which are silicate minerals made up of mostly chalcedony, a member of the quartz family. They are distinctive by their fineness of grain and numerous colors. Sandy Valley, just south and west of Pahrump and Shoshone Village both have a lot to offer Rockhounds as well. According to President Edwards, rocks are amazing and tell you a great deal about the history of the area. Each one is different, and some can be millions of years old. 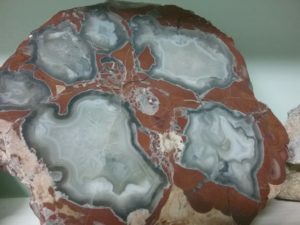 In the New York Natural History Museum, they display a rock that is 4.7 billion (that’s billion with a “b”) years old. Edwards goes on to explain that there are no ancient rocks in the ocean in that they are continuously moving. By ancient he means you probably won’t find one greater than 100 million years old. In the hills of Shadow Mountain near Pahrump, you can find rocks with fossils in them. 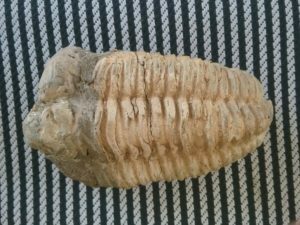 They are usually crinoids or plant stems, but you can also find trilobites or parts of animals. You may also find calymene trilobites, which are sometimes called mudbugs. They are bugs that have been fossilized into a rock and create an unusual pattern. Another one of the favorite places to visit is the week-long rock show, in Searles Lake, located in the Mojave Desert in northwestern San Bernardino County, California. This dry lake holds the mysteries of halite, a natural salt crystal that dries pink. Once a year, in October, they open up the lake to Rockhounds who wish to discover the halite. Most of the Rockhounds have their own equipment including tumblers and saws. If someone doesn’t have the right piece of equipment, the members are always willing to help by loaning theirs. They are also willing to help and teach each other how to process their findings. Many of the members also have a home workshop where they have their personal treasures on display. The group’s dream is to have a clubhouse of their own someday, so that they can share the beauty of their collections with each other and those interested in rocks and gems. Occasionally, the Rockhounds hold a group session at the Pahrump Library during the kids’ reading day. They work with sixth graders who are currently studying geology. As part of their curriculum, they take the students on rock field trips, so they can experience their learnings first hand and understand the importance of studying rocks to discover the history of the area. Dues to join the Pahrump Valley Rockhounds are $10 per year for an individual or $15 per year for a family membership. They meet once a month on the second Thursday at 6:00 pm and the meetings are light and fun. They always have a rock raffle to help raise money for the group. Their meeting location is the Pahrump Senior Center at 1370 W. Basin. Meetings are open to non-members. They do not meet in June, July, or August. If you are interested in learning more about them, you can contact Tom Edwards at TravellingTom2@yahoo.com. 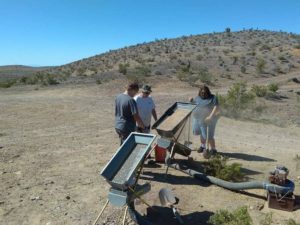 By working together, the Nye Gold Seekers and the Pahrump Valley Rockhounds can enjoy the beauty and knowledge of both gold prospecting and studying rocks and gems. The total membership of the NGS is about 95, and the Rockhounds are around 65. An estimated 45 members belong to both organizations. There’s a lot of camaraderie within and between the two groups. They are out to learn, discover new things, and help preserve the environment so that future generations can continue to enjoy the land. Having fun is also high on their agenda. They are always looking for new members and enjoy passing along their knowledge to others. If you’re visiting Pahrump and want to experience something unique, contact either Bonnie or Tom, and either one will be more than willing to talk with you and tell you about their organizations and how you can take advantage of them while you are here.